Pinch, punch, start of a new month. Nintendo of Europe has added a small batch of new Rewards to My Nintendo in the region, and as is normal is going for smaller and regular updates in comparison to Nintendo of America. This time around we have two full downloads - or rather one across two platforms - along with a handful of discounts. We're not sure the offering's going to rock anyone's socks off, but nevertheless here are the details. That's the lot for this update in Europe. It's not as meaty as the North American equivalent, but more will be added sooner in the EU as each territory pursues different strategies. Let us know what you think of the new additions in the comments. @BenAV For me its 'More stuff I already own, yay'. @Mega_Yarn_Poochy Nevermind that, I'm more upset that we don't get discounts/downloads for SNES VC games on N3DS at all! I'd appreciate an option to use my points to get Super Mario Kart or Super PunchOut!! on either N3DS or Wii U, rather than only the latter. I have loads of points, both gold and platinum, but there's nothing I want to spend them on. If I had enough gold coins I'd probably get Pilotwings. It's game I've always wanted to try. I'd have vastly, VASTLY preferred this to what we got in NA, ugh. Sigh I know this has been echoed a lot around here, but I really miss Club Nintendo! And suddenly I get to try out Pilotwings for the first time. I'll just get Pilotwings on the N3DS for FREE! So what about my over 3000 Platinum points, Nintendo? umm not all of us have a new3ds how about giving us old 3ds owners a download as well?!!! 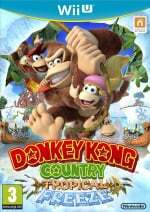 DKC Tropical Freeze for 15 euros! Thanks, I'll take that. I don't know what they can offer to redeem this reward system, honestly. The discounts on retail games are not that generous and come way too late in the console's lifespan. Many people already own the VC games they offer, especially the NES and SNES titles. I can play those in four platforms or so already, I'm not that interested in getting them, even if it's "for free". Things like miitomo clothing or 3DS themes are just not that enticing. Games like Zelda Picross and WarioWare Touched are good offerings, but Nintendo can't give us free games each week. Bad for business. I'm afraid we won't see this reward system take off until the NX and the mobile games that (presumably) take advantage of this are released. I'm pretty sure that's a reference, but I can't wrap my head around as to what it references. @AlexSora89 Oprah and that car giveaway, maybe? Oh, right! Forgot about that one! In my defense, however, I'm not American, so I happen to forget about some of the reference pools sometimes. 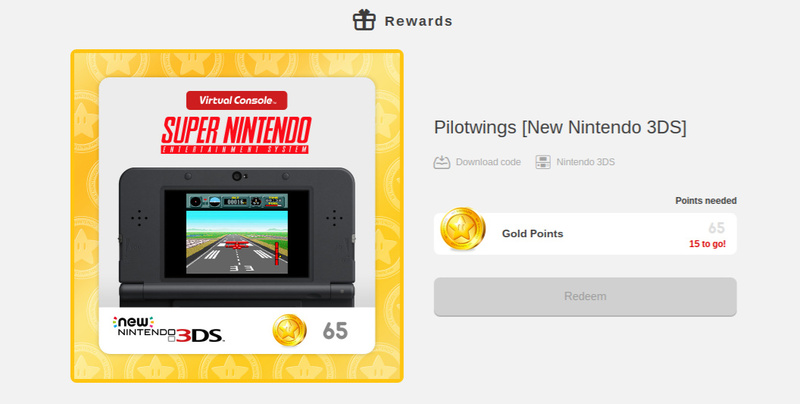 For 64 golden coins that you can only get by buying new software over €60, I expected old Pilotwings to be a freebie. This is a bit stingy of Nintendo! Tropical Freeze is, in my opinion, one of the best Wii U games so that it's a much easier recommendation. I got it at launch though. Wow, could my luck be changing? I almost bought DKTF yesterday! Glad I waited. I have over 2500 platinum points I know will expire. I give up. Thanks Nintendo for the service but I will stop. I'm 5 gold short of Pilotwings,typical! Got over 3000 plat points now and nothing to spend them on. I'm not a fan of discounts as I constantly try to get physical games. I'd prefer another ds digital download. Warioware was awesome. At this point I'd prefer club Nintendo back. I've bought enough Nintendo products that I would've been able to get a few rewards in the time it's been closed. I waited for 1st July to see what they bring up as I wasn't sure if I should save up the coins. I was holding myself with DK theme purchase just in case they will add something nice. There's nothing interesting so I will go for those Picross discounts then, they are quite coin cheap and it should be no problem getting enough coins for them hah. I was going to buy the Picross games someday anyway and the discount won't hurt. It's a pity tho that I had to sacriface the DK theme for nothing. I'm sucker for 3DS themes and I liked the yellow scheme of that one. But hey, discounts on games are better than themes, right? Already have Pilotwings, so nothing of interest here. I'm racking up the Platinum points though, so hope that they have something decent available soon! Not true. You get 70 gold on 50-59€ games and not over 60€. You could also take advantage of 40-75% discounts of these games to get the same amount of gold. Plus these are bonus rewards. You shouldn't buy games you don't like to get gold points to redeem more games you probably don't like. @MJInnocent Yeah, I think Retro did a much better job with Tropical Freeze than with Returns. Probably, the new employees helped them in achieving a much better visual art. David Wise's soundtrack helps, too. I think I'll go for Pilotwings on the Wii u. I never played it before, and I have the points. Here is a fan reaction after reading the new "rewards" offers. Youre the best, Nintendo. Dont forget to add some digital underpants for Mittomo for 500 platinum points. Can someone explain to me how it works? you use the coins to get 50% off? Gold coins don't let you get it for nothing? @BensonUii No offence intended, by the way. @PinkSpider Yep. Instead of giving 50% off on extremely expensive SNES ROMs, why they don't just sell these games at the right price and with a cross-buy option? And where is Pilotwings 64? Yohi's Island? Super Mario All Stars? Compared to the other digital stores, Nintendo's is lamentable. If anything good has come of this, their website has been improved so it's easier to see whether something costs gold or platinum points. Personally, I would like to see old VC games available for platinum points because it wouldn't cost them anything and lots of people (including myself) are racking up platinum points in no time at all. the only thing I like about My Nintendo are the 3DS themes we get now and then. Other than that Club Nintendo was far superior, a sentiment I thought I would never utter. But yeah, I would have expected another exclusive download now that Warioware Touched has ended at least. Even another DS download would have done, even if they are counted as DSiWare software there are more then enough small DS titles to fit the build (Yoshi Touch and Go comes to mind). Oh well, maybe by the time TP Picross has ended, they would have made another brand new exclusive (Urban Champion Picross anyone? XD). @VanillaLake YES! I love Yoshi's Woolly World too, enjoyed every minute of it, delightful. I do love 3D World too I have to say, it's the reason I bought my Wii U, the day SM3DW was released actually. It's a bit crap, really. If I get 9001 platinum coins, will I be able to get Dragon Ball Z: Extreme Butoden for free?